Jim Waugh, the youngest pitcher to win a game in the history of the Pittsburgh Pirates, passed away February 16, 2010 in Rock Hill, South Carolina. He was 76. In a professional baseball career that spanned six seasons, Waugh spent parts of two of those seasons in the majors with the Pirates from 1952-53. Immortalized by Topps in their 1953 baseball card set, I had the opportunity to interview Mr. Waugh in July of 2009 after he called me in reply to a letter that I sent to him asking him about his baseball career and for his autograph on the aforementioned card. Waugh called on July 6, 2009 to tell me that my questions about playing with Puerto Rican center fielder Carlos Bernier had piqued his interest, as he was thinking about Bernier around the time he received my letter. "What happened to Carlos Bernier?" Waugh asked. "I've been thinking about Carlos Bernier, particularly with this story about 100 years of Forbes Field." I had informed him that Bernier had met an early death, hanging himself 20 years prior. After lamenting the fact of Bernier's tragic death, he further described his experiences playing on the Pirates with Bernier. "He was just there a short time," he said. "He played for Hollywood in '52 and had a real good year. 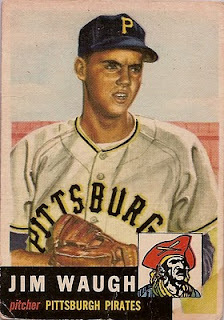 He came to the Pirates in '53 and played quite a bit in the first [part] of the year. I was sent to the minor leagues for the month of June, when I came back, he was gone. ... He played quite a few years in the Coast League. He could play the outfield; he could really run." As our conversation drifted to the Pirates youth movement when he was in the majors, he explained how he became the youngest pitcher in Pittsburgh history to win a game. "I just tried to get the ball over the plate," he said. "I was only 18, 19 years old. In my first major league start, it got to a point in the game where I was having trouble with my control. Joe Garagiola [who] was catching came out and said, 'Just throw the ball right down the middle of the plate, don't worry, it won't go there!' I ended up winning the game against the Cubs 4-3 (August 9, 1952), and became the youngest Pittsburgh pitcher to ever win a major league game at 18. Towards the middle of the season in 1953, I did learn to move the ball around and really became a pretty good pitcher after awhile, and then I started having arm trouble, and everything went away." Waugh cited the help of two veteran pitchers, Murry Dickson and Howie Pollett, in being instrumental in his development. They helped him how to refine his offspeed pitches. "Murry Dickson, who was our best pitcher, thrived on fly balls to center field," Waugh recalled. "He had pinpoint control. They called him “Heinz” because he had 57 varieties of pitches, which he did! He was something to watch. It really was something. He helped me a lot, always gave me a lot of encouragement. Howie Pollett helped me with my curveball to throw my curveball harder with a sharper break. I had that old high school roundhouse curveball, and he showed me how to throw a good curveball It used to be all in the breaking of your wrist, the wrist snap. Now it is more the fingers, the slider, the cut fastball. You get that spin with your fingers. You get a sharper spin and less break." Waugh was part of an overhaul at the time when Branch Rickey started to replace higher priced veterans with fresh faces from the farm system. He explained Rickey's reasoning behind the widespread change in personnel. "I was only 18," he said. "Bobby Del Greco, Tony Bartirome, Ronnie Kline, Lee Walls [were all under 21]. I roomed with Walls in a hotel in Pittsburgh for awhile. Bill Bell and I signed the same day for the Pirates. I was 17 and he was just out of high school; he was 18. This was all Mr. Rickey's idea. The Pirates didn't have much. They had veterans but they were finishing in last place. "I think he saw what the Phillies did in 1951, with young pitchers Robin Roberts and Curt Simmons and the "Whiz Kids" as they called them. He thought he could do that with Pittsburgh, but I don't know, the pitching just never developed. He relied on me a lot and I had arm trouble. Ronnie Neccai who struck out 27 batters in the minor leagues, he could throw really hard. He had ulcers, he didn't last very long. Bill Bell never came through, he had arm problems. Neccai has a good story on Wikipedia about his career; I believe he wrote a book about it." As he continued to reminisce about his career in Pittsburgh, we discussed his recollections of facing Jackie Robinson. This question sparked Waugh's memory about one of the better games he pitched and how it was reported by a young Roger Kahn. "I pitched one of my best games against the Dodgers in 1952," he said. "I started and was leading in the game 2-1, only giving up three hits through the seventh inning. In the sixth [inning], Jackie Robinson came up with a couple guys on, I struck him out. In the eighth, he came up again with a couple of guys on, and I had just struck him out with a really good curveball. I thought, 'Well, I'll just start him off with a curveball, just throw him a curveball for a strike.' Well, he was looking for that curve ball (laughs) and he ripped it past my head, a line drive! It really cost me the game, I ended up losing 3-2. That was my most memorable time against him." The Dodgers were the perennial front runners in the National League, and with their Hall of Fame lineup, the cellar dwelling Pirates just couldn't measure up to them. 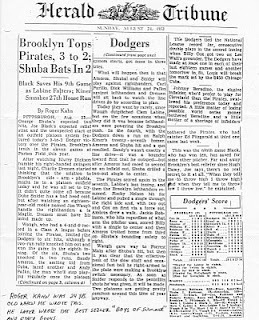 In 1953, the Pirates won less than ten percent of their games against the Dodgers. "[Brooklyn] were mostly right handed hitters, so it was a little easier for a right hander to pitch to them," he said. "In 1953, we only won one game against them, they won 23, we won one! (While still relatively futile, records for that season show it was two wins and 20 losses). I don't know if you ever read Roger Kahn's book Boys of Summer, he talked about Casey Stengel that year in the World Series, talking about the “Brooklyn Pirates.” 'We're playing the Brooklyn Pirates, don't worry about it, they're no better than the Pittsburgh Pirates.' He used that for a motivating speech. Roger Kahn wrote a good story about that. I'll send you a story that Roger Kahn wrote about the game I pitched against the Dodgers. He was only 24, [his] first year following the National League." Towards the end of the interview, we discussed his Topps rookie card and how he handled his autograph requests. He put most of his fan mail aside for five years while attending to his wife who was suffering from lung cancer. "I went about five years when I didn't and wasn't able to answer or reply to a lot of the fan mail," he said. "My wife got lung cancer and we were going through a lot. I just kind of gave up on it. I always enjoy getting the mail. I've caught all of those up. I have a lady who helps me with it so, I enjoy the letters. I enjoyed yours, it was interesting." Waugh appreciated the support of his fans, who continued to recognize him even after 50 years past him hanging up his cleats. He spoke proudly of a speaking engagement that he had at a SABR meeting. "I spoke recently to the SABR in Pittsburgh, and a reporter wrote a story about my talk," he said. "It's pretty interesting too. I really enjoyed that. Those guys are really knowledgeable."